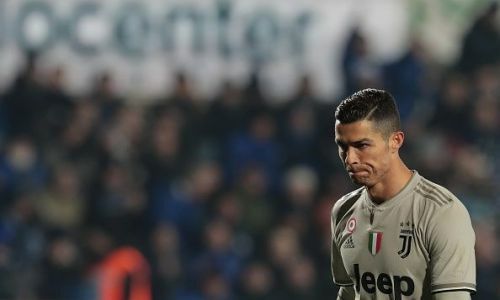 In what may be surprising news to some, statistics have shown that Juventus star Cristiano Ronaldo is the worst free kick taker in the Serie A.
Ronaldo, who is famous for his 'knuckle-ball' technique, has seen a decline in successful set-pieces in recent years. When he arrived at Turin, as in any other club, the Portuguese initially took charge of all free-kicks despite Paulo Dybala and Miralem Pjanic being excellent in the role. However, in early November last year, Juventus boss Massimiliano Allegri revealed that Ronaldo would be behind Pjanic and Dybala in the pecking order of free-kicks. Allegri said (via Calciomercato), "Ronaldo is a smart guy. He knows Pjanic and Dybala are excellent free-kick takers, and they are going to take those close to the area. When there are free-kicks from far away, Ronaldo can kick them, but we've decided that Dybala and Pjanic will take the set pieces close to the area." While Ronaldo has emerged as the top scorer in the Italian top flight, statistics have revealed that he has a lot of work to do when it comes to free-kicks. According to Fox Sports Asia, the 34-year-old has not converted a single free-kick for the league table-toppers, despite having had as many as 13 attempts so far. While the Portuguese's conversion rate for free kicks at former club Real Madrid stand at over 6 percent after scoring 30 goals, his numbers at Juventus stand at 0. The Serie A player with the best free-kick conversion rate is Napoli's Arkadiusz Milik who has converted two out of three free-kicks so far this season. Despite not having the best free-kick conversion rate, Ronaldo remains to be the top scorer in the Serie A and his numbers are only said to go up, with or without successful free-kicks.